A strapping machine dispenses straps that help keep bundles, packages, and boxes together. Strapping machines are used in various industries including construction and packaging. The process of strapping makes bulk shipping easier as products are strapped together, which allows the boxes to be shipped without falling over and it also enables the transport of more products at the same time. These machines ensure product safety and they also reduce overall liability of the business. These machines use different materials like polypropylene (PP), polyester, and steel to ensure maximum safety. Strapping machine manufacturing is a highly competitive business. Thus, most companies focus on developing new products and technologies to provide customers with highly advanced machinery. 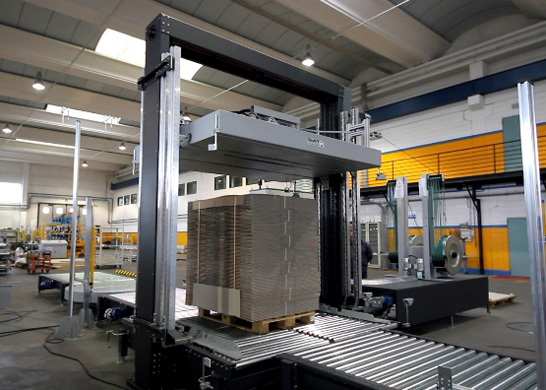 To put this in perspective, Mosaca GmbH recently introduced a new cross-strapping machine, Universal Corrugated Bundler (UCB), designed to be used in corrugated cardboard sector. The new machine ensures simplified strapping of non-symmetric cartons and several other complex products. It straps folding carton stacks with PP straps with different widths (from 5 to 12 mm). In addition, it features a unit with patented SoniXs ultrasonic sealing technology and its electromechanical components with brushless DC drives ensure reduced wear. According to the findings of a new report available on Grand View Research, Inc.; the global strapping machine market is estimated to register a strong CAGR of around 5% over the forecast period (from 2017 to 2025). This growth can be attributed to the rising demand from construction, packaging, and other industries. Rising need for safe transportation of various products are also anticipated to augment the global market over the next few years. Signode Packaging Systems Corp.; Mosca GmbH; MJ Maillis S. A.; Messersì Packaging S.r.l. ; Transpak Equipment Corp.; and Samuel Strapping Systems are some of the key players in the global market for strapping machines. These players are focusing on collaborations and partnerships with other prominent companies to sustain the competition and to gain maximum market share.